In graph theory, a Cactus is a connected graph such that any distinct two simple cycles in the graph share at most one vertex. Here is a Cactus with 3 simple cycles outlined with dashed lines. 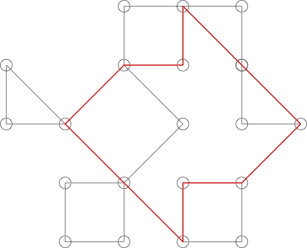 The following graph is similar to the one pictured above but is not a Cactus because the two vertices labeled in red are shared by two simple cycles. This cycle shares more than one point with a lot of the more obvious cycles in the graph. 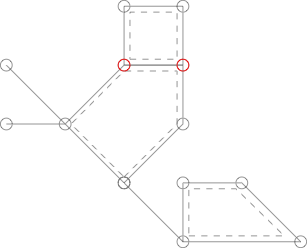 A connected graph is a graph such that there exists at least one path between any two vertices. A simple cycle is a path on a graph that starts and ends at the same vertex and visits no vertex more than once. 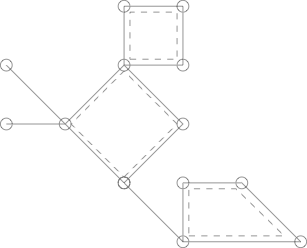 A simple graph is an undirected, unweighted graph such that no vertices are connected two each other by more than one edge and no vertex is connected to itself. A simple graph is the most basic type of graph and is what most people mean when they say graph. Take a simple graph as input and decide whether it is a Cactus graph. You should output two distinct values one for True and one for False. You may take input in any format you see fit. This is code-golf so you should aim to minimize the byte count of your answers. Not the answer you're looking for? Browse other questions tagged code-golf decision-problem graph-theory or ask your own question.